EDITOR'S NOTE: The Catherine Dianich Gallery at 139 Main St. (down the alley by Gallery in the Woods and off the entry foyer) is hosting work by Alisa Dworsky in October and November 2011. Meet Alisa during Gallery Walk on Friday, October 7, 5:30 to 8 p.m. Below is a brief profile of the artist and her work. 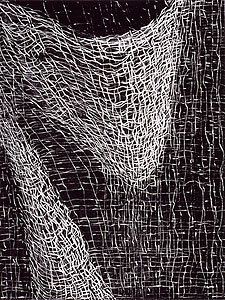 Alisa Dworsky's artwork includes sculptures of crocheted rope, intaglio prints, graphite and charcoal drawings, and large-scale installations. 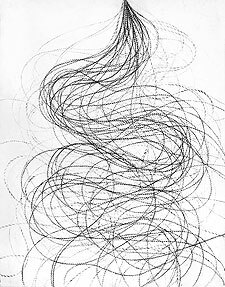 She explores how human beings use geometry and systems of order to make use of the landscape, and her work is influenced by textiles, agricultural patterns, computer drawings, topographical maps, architecture and the most basic principle of quantum physics that in all matter there is movement. 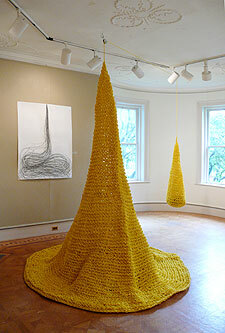 The exhibit at the Dianich Gallery presents works from Dworsky's Fine Cord series of prints, the Fil de Cuivre series, the Yellow Poly Rope series, and the Wave, Particle, Duality series, as well as two of her crocheted-rope installations -- each uses the concept of "line" in a different way. Marc Awodey wrote of her work in a Seven Days article last January: "The German modernist architect Ludwig Mies van der Rohe is associated with the expressions 'Less is more' and 'God is in the details.' 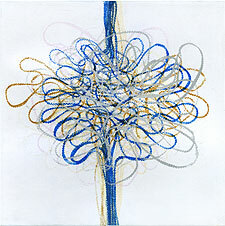 Dworsky seems to take both those statements to heart in her majestic simplicity of materials and complexity of design." Dworsky has created site-specific installations for the Bennington Museum, the Burlington waterfront, the Fleming Museum, the Brattleboro Museum & Art Center, and a highway installation with the Vermont Agency of Transportation (a mile-long set of linear patterns made using one thousand blue and green reflector stakes). 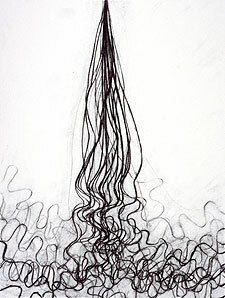 Recent exhibits include a solo show, "Drawing Strength," at the BCA Center in Burlington, installations in "Fabrications" organized by Cynthia Reeves Projects, and exhibits in Montreal, Boston, Somerville, and New Canaan. She has received numerous grants from the Vermont Arts Council and the Vermont Community Foundation, has a Master's in Architecture from Yale, a BA from Stanford, and is cofounder of the design firm Terra Firma Inc. with her husband Danny Sagan. She lives in Montpelier, Vermont. Visit online at www.alisadworsky.com for further information.